NROCKS Outdoor Adventures (formerly Nelson Rocks Outdoor Center) is the premiere guided climbing center in West Virginia and the North Fork Valley Region. NROCKS is home to the nation's premier Via Ferrata, the North Fork Valley Canopy Tour and also offers guided sport, top rope climbing, and zip lining. Book an adventure today! Visit an old time general store. Call (304) 567-2555 for information. Ride a real old time steam locomotive in some gorgeous countryside. The center is located at the foot of Seneca Rocks. It's a great place to learn more about the geology of the region and the Seneca Rocks formation. Call (304) 567-2827 for information. A beautiful place to visit with forested scenery and outdoor activities. It's about one hour from Seneca Caverns. Spruce Knob is the highest point in the state, rising to 4,860 feet. You can drive to the top and walk to the observation tower, or hike on its many trails. It takes about 45 minutes to drive to the top. This beautiful park includes Spruce Knob and borders Seneca Caverns. Home of the world's largest steer-able telescope. About 40 minutes from Seneca Caverns. 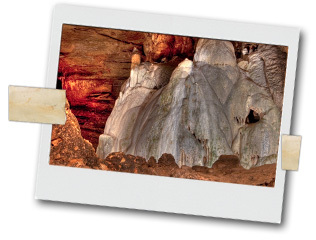 Seneca Caverns is located in the heart of this recreation area and a day in the outdoors is right out our back door. Visit the US Forest Service website for more information on these areas at fs.usda.gov. Canaan Valley Resort is a four-season destination providing the perfect escape from the pressures of daily life. Timberline is also a great, four-season destination. Your alternative to conventional accommodations, located in Grant County in Petersburg. A relaxing vacation getaway for families and honeymooners, or an adventure-packed outdoor recreation experience! A complete selection of motel, camping, tee-pees and more. Secluded log cabins with panoramic views of Spruce Knob, Dolly Sods, eastern slopes of the Allegheny mountains and an inside view of Germany Valley and the North Fork Mountain Range. Having a "home base" to come back to after a day of West Virginia outdoor adventure is important, which is why NROCKS offers convenient on-site lodging options that include brand-new guest rooms, the Yellow House Inn vacation house, rustic cabins, and tent camping. Appalachian Cabins combine the rustic charm of yesteryear with the comfort of modern day conveniences. The cabins were constructed in the same manner as the early settlers of this area used to build their homes more than a century ago. A great place in Petersburg, WV. Call (304) 257-1049 for information. Located in the beautiful town of Franklin. Call 1-800-338-3351 for information. Revelle's River Resort is located deep in the heart of the Monongahela National Forest. It is located along more than 2 miles of river frontage. Let us welcome you to our luxury honeymoon cabin rentals located in Tucker County, West Virginia.